I brought this up in my last post, and figured now would be a good time to take a look at my flagship binder. Back when I first returned to the hobby, one of the first collecting projects that popped into my head was to collect a card from every flagship Topps set. I didn't really stick with that idea, but I did eventually stumble upon completing that somewhat forgotten goal. But now, inspired by similar projects of other collectors, I've expanded that early idea to be a full page for each flagship set. I've still got a long way to go, but I've got enough to get a post out of it. 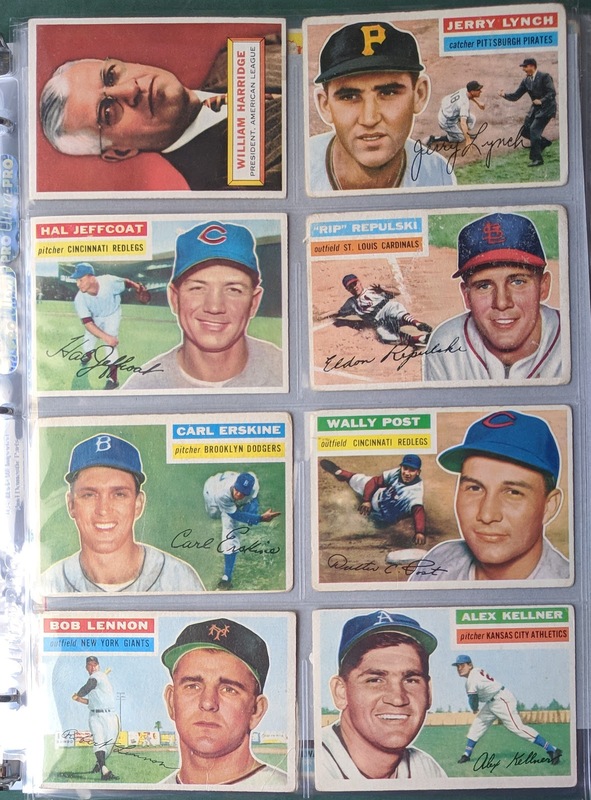 My scope, at least for now, is Topps from 1951 through 1993 (the year I initially stopped collecting). I do plan to probably include other mainstream card manufactures eventually, and perhaps widen the span of years included (i.e. creeping back a few years for early Bowman, and perhaps stretching to present day). Hey, I could even see myself adding other sports into the project way down the line. 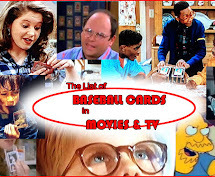 But for now, yeah, just Topps Baseball '51 thru '93. 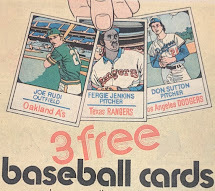 Actually, I haven't even gotten thru the 70s yet, as far as starting binder pages, but they'll happen soon enough. Oh, and the binder is very "fluid" as far as cards can come and go; nothing locked in permanently. These are all cards that don't fit in a PC or setbuild for me (unless it's a double, of course). Basically, every card is potentially trade fodder, though some cards would take a very compelling deal for me to part with. Ideally, every page will be full of notable cards (big name players or otherwise interesting cards), though for now there are still plenty of "commons" filling slots. Most of these cards (at least from the 50s and 60s) were cheap card show pickups over the years that I couldn't pass up for the price, even if they didn't exactly fit in my collection. Without further ado, let's check out the first few pages. Full disclosure, this 1951 Topps Monte Irvin card isn't in my binder at the moment. Grabbed this pic from an old post. I need to dig it out of my collection, wherever it's hiding (hopefully I didn't trade it away and forget I did so). But when I find it, it's going center square on the first page. 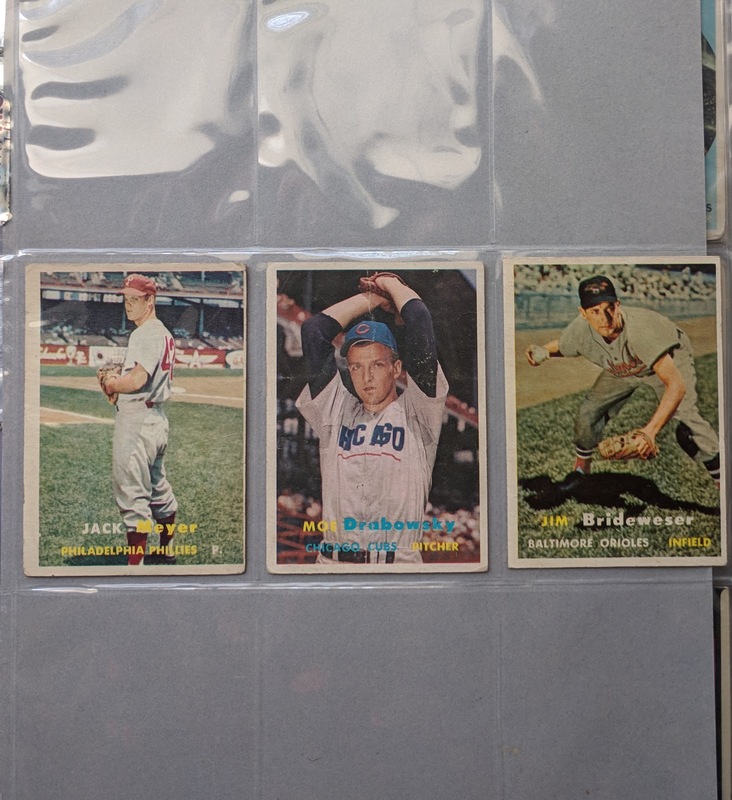 1952 Topps is represented by just 3 creased cards. Between Puddin' Head and P-nuts, this page takes the award for best nicknames present, at least. 1953 Topps - the 6 cards I just bought at the show last weekend. 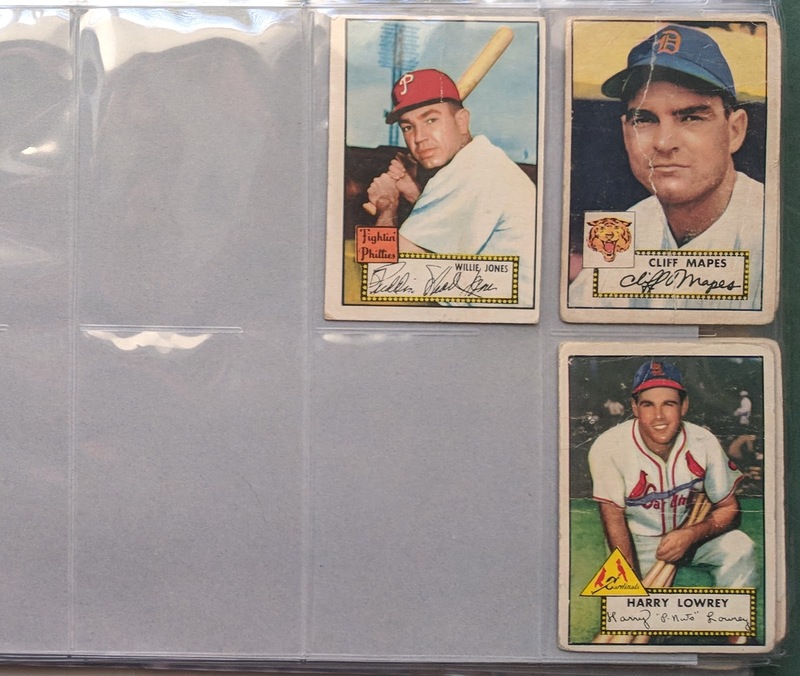 1954 Topps is halfway to a completed 8-pocket page. I think 1952 AL MVP Bobby Shantz takes the prize for best card of the page. 1955 Topps' page is highlighted by 1953 AL MVP Al Rosen. 1956 - Our first full page! 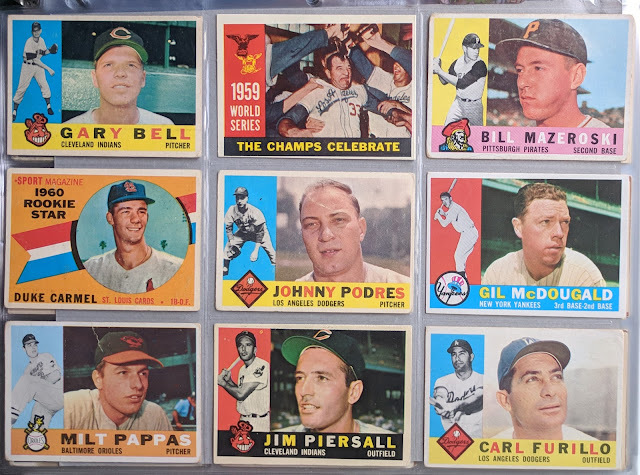 1957 Topps is looking sparse, but that's because I'm building the set. These are dupes from the last card show. And I know I have a few more dupes, but I need to sort out my setbuild.. don't have it in order yet. I got some interest in my extra Jim Brideweser cards in the comments the other day after accidently buying 5 freakin' copies of the same card at the last show. And yeah guys, just take a look at my wantlist and get in touch about a trade. 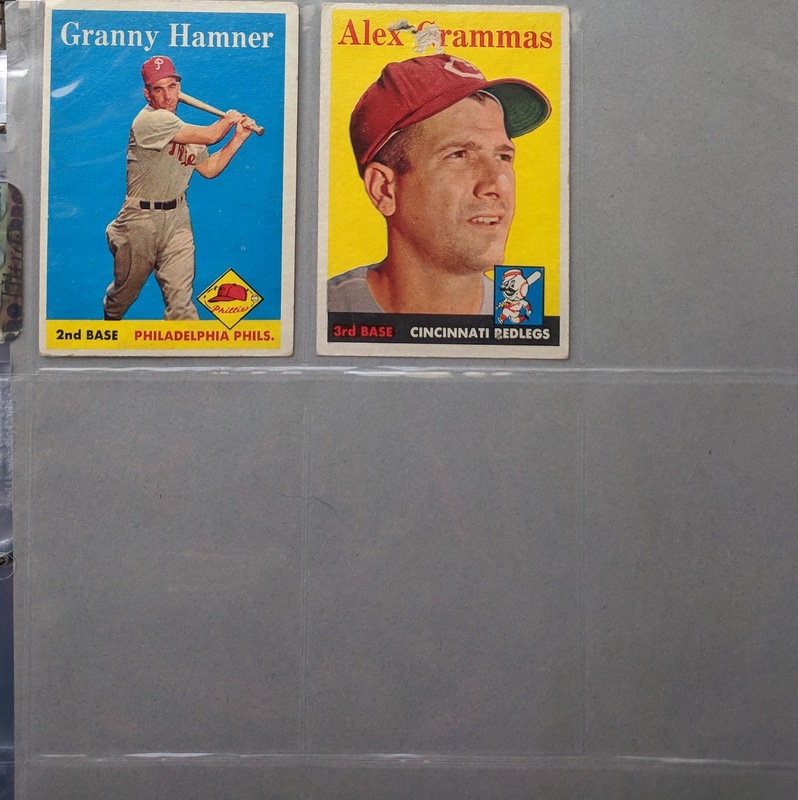 Though it's only 2 cards deep so far, 1958 Topps might be my favorite page in the binder.. the funniest page at least: Granny and Grammas. LOL. I promise I didn't do this on purpose. 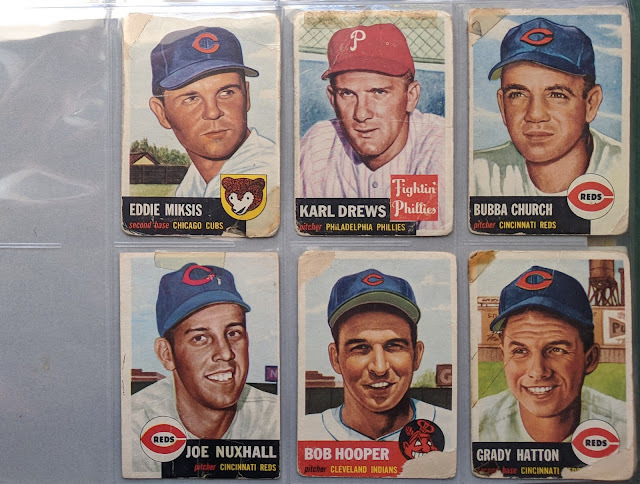 Just a happy accident that I have two non-PC cards from 1958 and they both call to mind grandmothers. 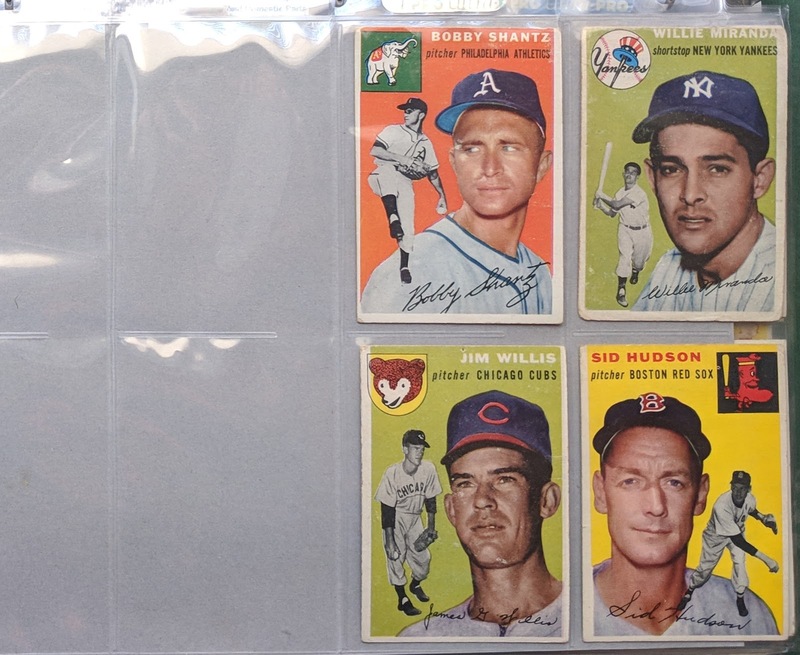 I've been kicking around the idea of working on 1959 Topps someday after I finish the vintage sets I'm in the thick of, and as such I often pick them up if I find them cheap at a card show. So it's no surprise I've easily filled a page, with cards to spare. Some decent names here, but plenty of room for upgrading this selection. Red Schoendienst is a HOFer, but tough to beat a guy named Coot Veal. 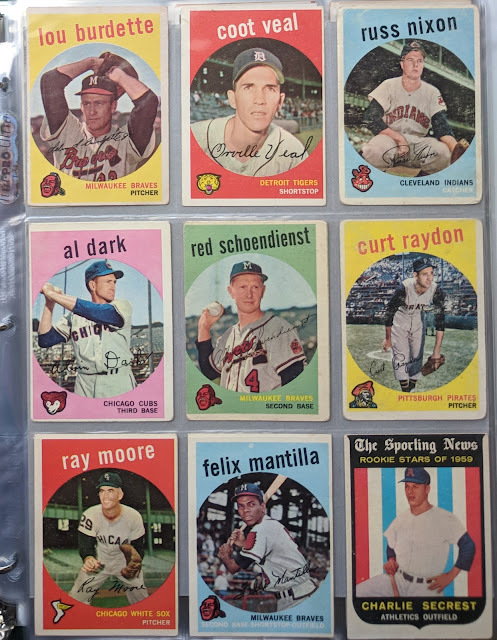 1960 Topps is another full page, and boasts some solid names. "The Champs Celebrate" is a classic, and anchors this Dodgers-heavy page. 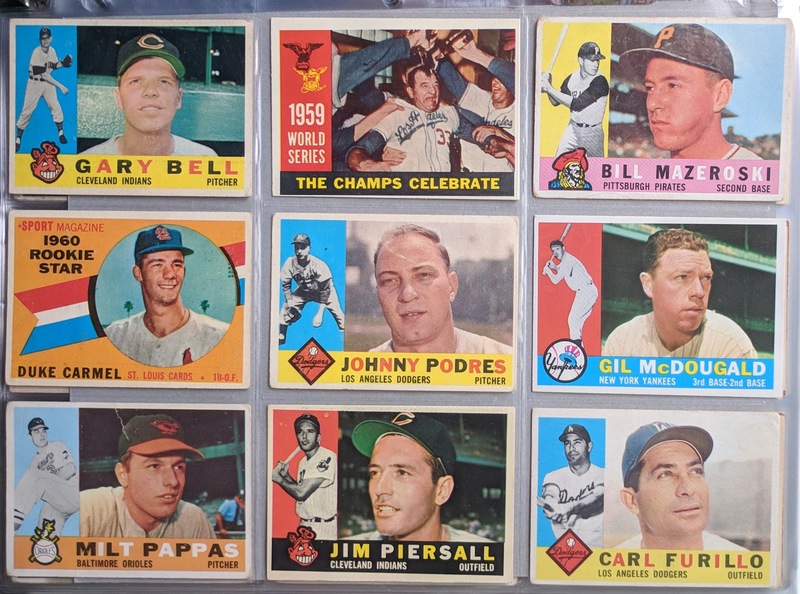 I think I'll quit for today here, but plan to pick it back up with 1961 Topps in an upcoming post. This should be a project people/bloggers/traders can help complete. Should be a fun ride. Oh dude that 1959 Burdette is all kinds of messed up (misspelled name plus he's pretending to be a lefty). That 51 Irvin is sweetness too. 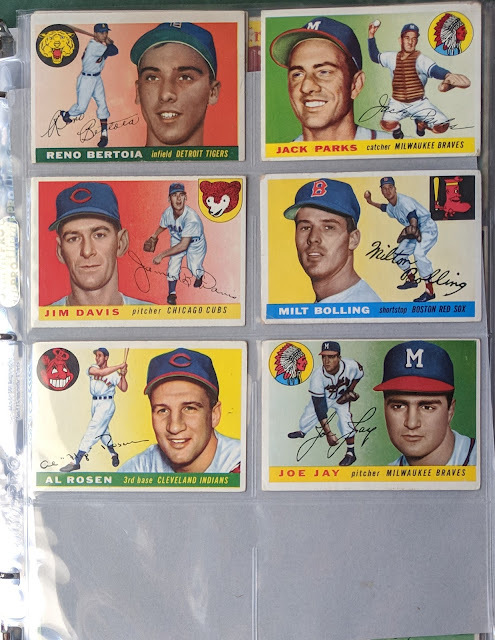 Also while my childhood goal was to get one card from each year I have to say that one of the most fun parts of being a team collector has been putting these pages for each year together. I really like this concept and it looks great to see it like this. Great idea. I might consider doing this... except I'd be using keepers. And 8/9 pocket pages would be setting the bar way, way, way too high. I think I'll start with just one card for each year. Like others have already noted, I might take this idea from you at some point...as if I don't have enough on my plate already. Nice start! Looking forward to the completed project! This is a great idea! I can always get behind binder-themed projects.